I have a confession which really isn’t a confession since it’s pretty obvious : When it comes to Asian cooking, I haven’t a clue most of the time. To this, I might add something possibly incendiary: although there are many people out there who are progressive, there are a lot of people who aren’t and it happens fairly often that I meet people who think that as someone of Asian descent, I eat rice like it’s going out of style, am quiet, reserved and demure, and have relatively little body hair. Imagine their faces when they find out that I swear like a sailor, have no filter and can hold my liquor like a white divorcée. In regards to the swearing, now that I’m older, I have made a concerted effort to swear less. Mostly because it makes the times when I do swear even better! Just kidding 😉 In all honesty, I think that I swore so much in my youth that I used up all of my swear words. I just don’t want to swear anymore. Can believe it? I can’t! As for the filter? Visualize some big rusty grate with giant holes in it. The kind that lets almost everything through except for large, plastic soda bottles and shoes. I have worked hard on that too since I realized that speaking without thinking is best way to get misunderstood. I still think of my filter as that grate, but now it’s jerry-rigged with an intricate network of fishing line and wire. Some stuff still gets through, but much, much less than before. Thank goodness! In terms of Asian food, I am not completely ignorant because I happen to know plenty about eating it. I have never met a sliced jellyfish, deep-fried octopus ball, bowl of noodles, dumpling (oooooh, dumplings), taro puff, sweet red bean fritter, bao, roll (spring and summer), lotus bean paste-stuffed pastry, chicken adobo, preserved egg, roast duck, suckling pig, hot-pot, under-cooked chicken meatball, wad of natto, head-on shrimp, whole fish, chili crab or Spam musubi that didn’t make my motor run. However, when it comes to the nitty gritty of cooking, I am a babe in the woods. The amount of times that I have stir-fried can be counted on one hand with fingers to spare. I did attempt a stir-fry about a week ago and it was an epic fail. I actually asked my mom right before I did it too. I pictured her putting the phone down and walking away in shame. Or maybe it wasn’t shame, but just a refusal to tolerate such a dumb question. So after mangling that stir-fried chicken and bok choy dish (I wilted that poor bunch of greens into a pathetic nothing), I have decided that this summer, I am going to get in touch with my yellow-ness and make a good-hearted attempt to become a little more educated about how to cook some of that food over there. I know it’s kind of wrong to lump all the Southeastern and Far Eastern cultures together, but isn’t it much more efficient to refer to all peoples who use sticks as utensils as one group rather than many? I want to learn to cook a little Chinese, some Japanese, some Korean, some Filipino, some Indonesian, some Vietnamese, some Thai and more. I’m going to try it all. I’m almost completely new at this, so if I stick two things together that really don’t go, like using a sauce meant for fish on cheese, please do let me know. I bet you can all stir-fry circles around me, so I’m counting on you for help. 1. Separate the leaves from the baby turnips. Trim the turnips and cut them in half if they are too big. You want all the turnips and turnip pieces to be roughly the same size so that they cook evenly. Roughly chop the greens into 2-inch pieces. 2. In a large saucepan, heat a knob of butter and about a teaspoon of sesame oil together over medium heat. When the butter begins to foam, toss in the baby turnips. Carefully add a splash of soy sauce to the pan along with some Aleppo pepper or shichimi to taste. Sauté the turnips until they begin to lose their opacity and turn translucent. Add the greens and continue to cook everything until the greens are wilted and the turnips are cooked through. Adjust the seasoning and serve. They were adorable. I was going to get regular baby turnips, but I kept going back to the farmer who had these. Take advantage of them while they are here! LOL … great post. The Spam mitsubi sounds intriguing! I love those little turnips. I’ve never seen them before but if my wife grows radishes this year I bet they’d work well instead. Spam musubi rocks, but I am all about these kinds of regional foods. Even when they use an ingredient as mocked as Spam because that one food shows movement, adaptation, acculturation, history. Fascinating! I had never seen such adorable turnips before. They were about the size of quarter. So cute! Those baby turnips are so incredibly cute! Do they really taste like turnips? They do! They are absolutely adorable! The farmer said that they were Oriental Baby Turnips, but google says they are Japanese baby turnips. The texture is a little firmer, but they are super yummy. They are very cute turnips. Like little vegetable truffles. Oh my gosh, that is an idea: tell your husband that inside the “turnip” is a liquid gold center of cheese and bacon bits! Funny! I’m just glad to know you actually like Asian food. You crack me up. Hey Asia is a big place, we should be able to lump the food together and get something good. The food looks awesome, all the females in your family line would be proud. I think my mom is proud . . . hard to tell! Thanks! It makes me think of thin, blonde women with lots of diamonds and McMansions! Oh, yeah, almost forgot. I think the use of butter and soy sauce together is a fab idea. Must try!! Looks delicious and simple to make. You are so funny. I know something about Thai cooking and a little about Japanese but that’s about all I can provide in terms of technical support for Asian cooking. In exchange, I expect mayonnaise-rescuing advice when I need it. 🙂 I make a recipe I found forever ago on Epicurious where you braise these darling little turnips and then coat them in butter mashed with miso–a delicious variation if you get these again! That recipe on Epicurious sounds so yummy! If I see more Japanese baby turnips at the market, I am totally going to toss them in miso and butter. Sounds awesome! I’m the same way, especially the part about holding my liquor like a white divorcée. Going to start using that line, haha. Use it! It’s a great image. Makes me think of sauced, aging debutantes or Falcon Crest! I don’t know much about Asian cooking, except I love eating it too! I’m starting to learn about the variety of ingredients and I love to try them. In my (mom’s ABC side of the) family, there are things that we all just know how to make, but I have to say, we all have a few Chinese cookbooks on the shelf and pull them down often. Maybe it means we’re bad Asians, but Gloria Bley Miller’s, Thousand Chinese Recipes is a well thumbed reference in our kitchens. This recipe, meanwhile, has me itching to grow turnips! My mom owns some cookbooks, but they are all in Chinese. I will definitely check out the one you recommended though. A well-thumbed book means a good book to me! I bet if you were to grow turnips, they would be awesome! soy sauce and butter! and darling baby turnips! I will make this, see if I don’t. Then she walked away because she couldn’t believe I could be so dumb! 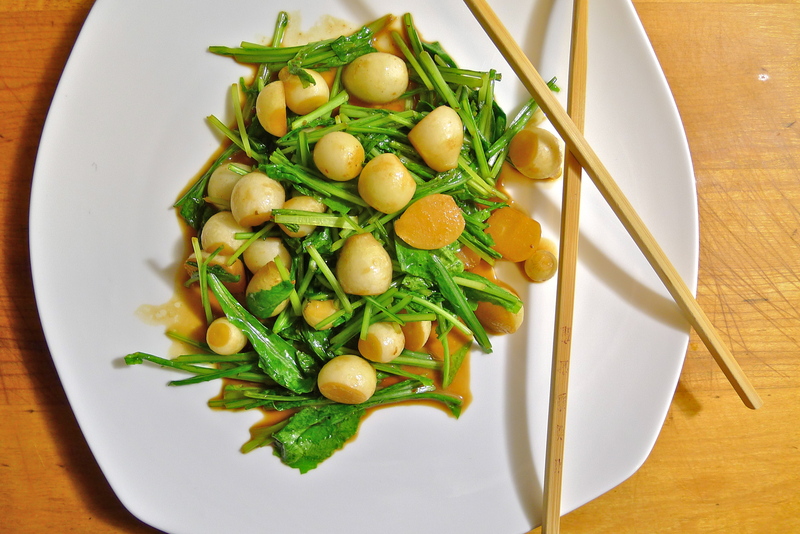 Looks like a great recipe but I’ve never seen Japanese baby turnips here. I hadn’t either until that day at the market. I think the recipe would work well with regular turnips too. Just cut them up. Thinking about it is making me hungry! And if it’s closer to dinner time, how about serving it stirred into freshly cooked pasta!